Stephen Colbert is, seriously, Catholic. He attends mass, observes Lent, and teaches Sunday school. "I love my church, and I'm a Catholic who was raised by intellectuals, who were very devout. I was raised to believe that you could question the church and still be a Catholic." He started his career in comedy with the Second City improv troupe in Chicago. There he met actress/comedian Amy Sedaris (sister of author and NPR favorite David Sedaris) and comic Paul Dinello. Together, they developed the short-lived (but critically acclaimed) HBO sketch comedy series Exit 57, which won five Cable ACE awards in 1995 for best writing, performing, and comedy series. In 1996, he was hired to write and perform sketches for The Dana Carvey Show (aka the "Mug Root Beer" Dana Carvey Show, aka the "Taco Bell" Dana Carvey Show). This was also a short-lived endeavor, but Colbert stood out as a Phil Hartman-like everyman capable of exuding both exuberance and despair in a single take. From there, he worked with Robert Smigel as the voice of Ace for Saturday Night Live's animated shorts Ace & Gary: The Ambiguously Gay Duo. Colbert has also contributed his vocal talents as Reducto and Phil Ken Sebben on Adult Swim's Harvey Birdman: Attorney At Law and several characters on Crank Yankers. 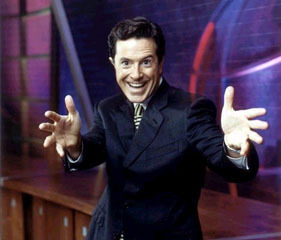 Colbert, Sedaris and Dinello struck a collaboration again in 1999, and developed Strangers With Candy for Comedy Central. Colbert has one dramatic role to his credit: an episode of Law & Order: Criminal Intent where he portrayed an antiquarian document forger who lives with his crazy mother. The storyline for this episode appears to be "ripped" nearly frame by frame from an episode of CourtTV's Masterminds. In 1997, Stephen Colbert became a fake senior correspondent on The Daily Show, where he worked alongside Steve Carell, who does the voice for Gary, the other half of the aforementioned Ambiguously Gay Duo. Colbert left the Daily Show in 2005 to create the spinoff The Colbert Report, satirizing the self-obsessed, hard-boiled commentators on Fox News. On 29 April 2006, Colbert was invited to speak at the annual White House Press Corps awards dinner, using the event to skewer both the assembled journalists and the attending politicians, among them sitting President George W. Bush. Colbert left The Colbert Report at the end of 2014, leaving his blowhard persona behind to succeed David Letterman as host of CBS's The Late Show. Stated his date of birth on-air to be 13th May. Previously thought to be 20th April.